You are here Home » Travel Photo Thursday — June 5/14 — Summer Travels — Beach, Food, History, Sun! Travel Photo Thursday — June 5/14 — Summer Travels — Beach, Food, History, Sun! Here we are, week 180 for Travel Photo Thursday! Welcome! The semester is winding down, although I have to be here longer than usual this year. Living in a culture where everything happens at the last minute makes personal planning a real challenge. I finally know for sure that I can leave anytime after July 11th, so last night I booked my flight to Penang. I even managed to use my frequent flyer points, which was totally unexpected. My jaw dropped when I actually saw the availability pop up on the screen. Not that long ago I mentioned that I thought I would spend the summer in Langkawi, but as much as I like the island, I decided that I would probably be bored after a week. There’s lots to do in Penang, and the food scene there is one of the best in Asia. I may even get to hop over to Langkawi for a few days. We’ll see. Today I’m sharing some photos of past visits to this lovely island city. 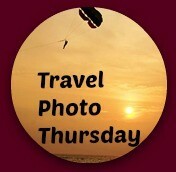 The Twitter hashtag for Travel Photo Thursday is #TPThursday. 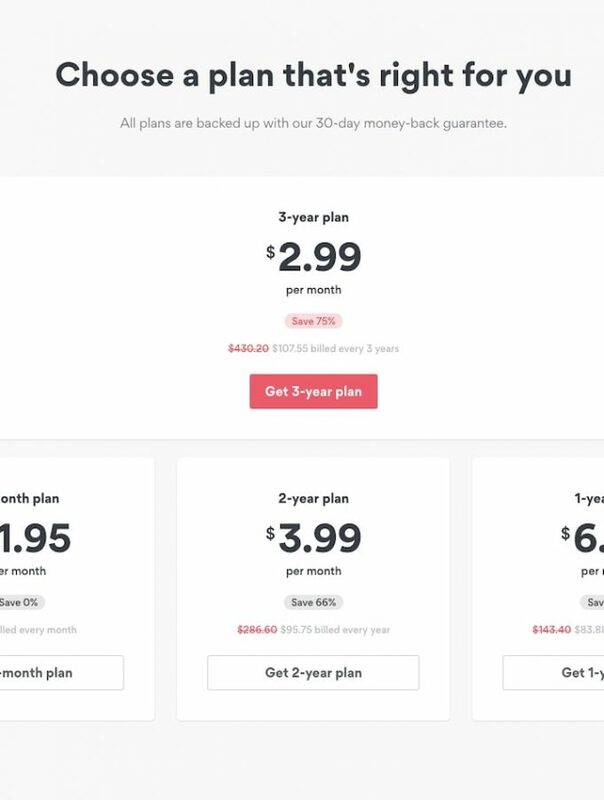 As a courtesy, please post a link to Budget Travelers Sandbox. Looking forward to actually seeing the inside of Kek Lok Si temple this time. The largest Buddhist temple in South East Asia, as impressive as it is on the outside, I’d say it must be just as much so on the inside. 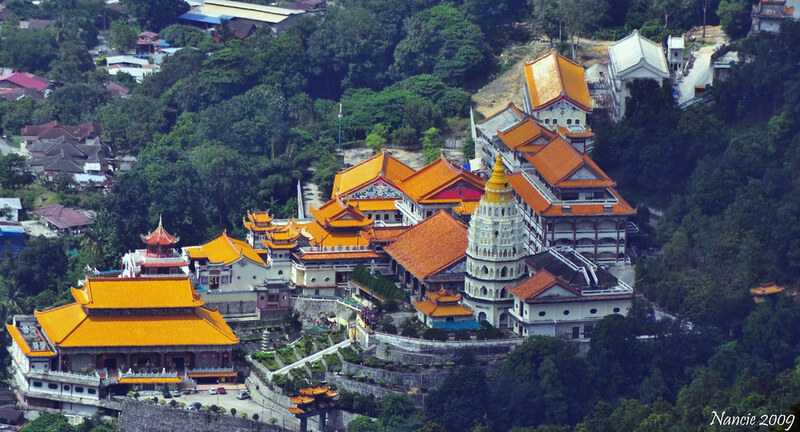 I first saw this temple on my to Penang Hill, and it was my intention to stop in on return. Well the camera gremlins weren’t cooperating that day. By the time I came down from the hill the batteries were dead, and my SD card was full. That’s not happening this time! 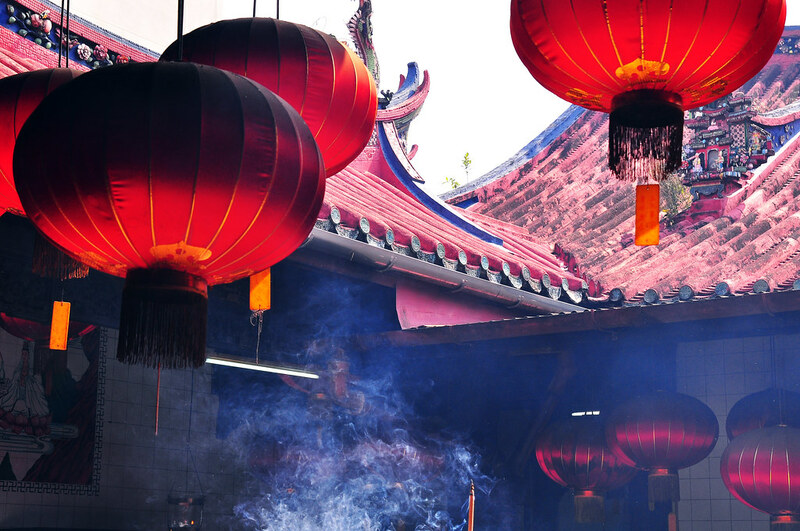 There’s also Kuan Yin Temple in Penang’s historic Georgetown. Photo opportunities abound, and not to be missed at the full moon. Love the smoke from the smoldering incense! Historical Love Lane in the center of Penang’s Georgetown. You’ll find some fabulous architecture here. The lane is full of quaint guest houses, hostels, and hotel; a perfect place to stay. And of course, what Penang is known for; it’s amazing food. Who can resist onion baji? Penang also has come gorgeous white sand beaches. Unfortunately, those shots seem to be on a hard drive that didn’t want to cooperate today. Do trust me, if you get to Penang, don’t miss the beach! This is the 180th edition of Travel Photo Thursday. You can browse the archives here. Hi Nancie, glad to hear that you have your travel plan set for your the semestral break. Frequent flier availability, yay! I know, It seems like an endangered species these days. Between this post and Michelle’s posts about Penang, I’m itching to go thee soon. 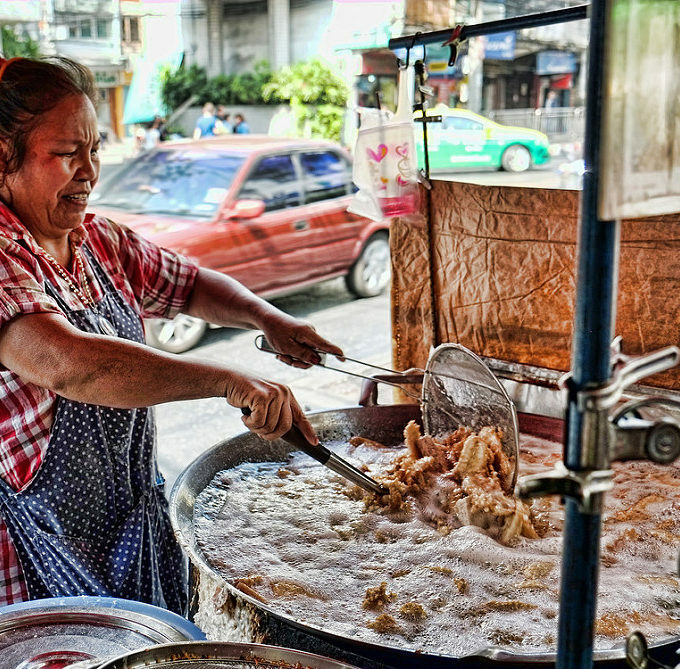 I would love to visit the largest temple in South East Asia and devoured on the amazing food. Enjoyed your shots, especially the smoky temple. I hate those camera gremlins! You’re so lucky to be able to go back again to a place where your camera let you down, to try again for fab shots! That temple looks incredible and sort of almost Tibetan, (though I imagine in reality it doesn’t look so Tibetan, it’s probably just the hillside setting). Have a great time in Penang; I went there once a long long time ago and would love to go back. Thanks again for hosting #TPThursday. Gosh that term seemed to go so quick Nancie. Penang is certainly on our list of places to visit. I for one can never resist an Onion Baji. I look forward to hearing more about your take on Penang. Hi Jackie, I was shocked to get the ticket with my FF points, and the taxes weren’t too over the top. I’m not happy at having to hang around here for an extra three weeks this summer, but like you say, it will go fast! I always hear good things about Penang and the food does look awesome. To use my frequent flyer points I usually find myself booking out at least 6 months in advance and now some of the free tickets have so many taxes added on, it hardly seems worthwhile. You’ve got a month to go but do students hang around until the very end? You always seem to have great, long holidays. Thanks for the wonderful pics from Penang. I especially liked the atmospheric shots with the red lanterns. We are going to Penang in October, and really look forward to hearing tips and see pics from other travellers, of what to see and do there. We were in Penang about 10 years ago at a dragon boat competition, so didn’t have time to see much. So looking forward to exploring more this time. Excellent choice!! I think that you will find that George Town has changed since you last visited. I certainly know that it has in the last 3 years that I’ve been here. So, there will be many new things to discover like all the Ernest Zacharevic street art while still being able to revisit your old favorites. Since you have so much time here, you may want to consider being an extra in the new BBC series they are filming here called Indian Summer. Penang is standing in for India at the end of the British Empire’s rule, and the series is being described as an Indian Downton Abbey. My friends tell me it makes for an interesting day, plus you get paid. What a stunningly beautiful temple. I love the colors of the roof against the vegetation and the contrast with the color of the walls. Glad the camera worked fine this time so you could bring us these lovely shots. Hope to see the beach scenes next time. Penang looks wonderful. You must be excited to have another visit planned. Congratulations on finishing the school year (soon) and being able to set some plans into action; always a great feeling. I’m tend to always think 1 or 2 steps ahead of where I am, on to the next big thing.  Photos are fun, especially the one of what I think to be a sumo wrestler! The colors of the temple and people just pop out at me saying come and visit. This will be an interesting couple weeks for you to check out the unusual places. What wonderful photos of Panang. I especially loved the aerial view of the monastery. I love Malaysia, but have never been to Georgetown…What a great place to spend the summer. Happy travels, Nancie! I’ve read so much about Malaysia and Penang looks amazing! 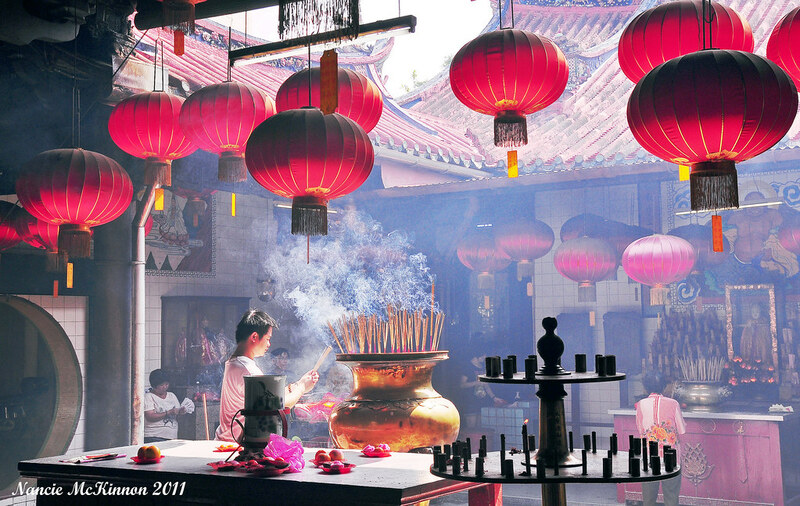 I especially like the photo of the incense burning with the lanterns above. I’m looking forward to reading your posts this summer! The Kek Lo Si Temple looks quite amazing. I just wrote a blog post on Singapore and from what I’ve read about Malaysia, it’s not hard to imagine why the Malays unanimously voted Singapore out of their federation. Given Singapore’s success on so many levels, I wonder if they’re sorry now. Penang looks so beautiful! That Kek Lo Si Temple is quite a sight and I hope you get to go inside this time. I hope you have a wonderful vacation and great deal on the FF flight. Food, temples and sightseeing certainly makes for a fun adventure and trip. That is great photography and also info. Thanks for hosting this meme.